S Pen and its features are what separates a Galaxy Note from a Galaxy S flagship smartphone. Every year, Samsung makes many incremental improvements to its S Pen, but this year the company has made probably the biggest changes to S Pen since its inception. Apart from retaining and improving all the previous features, the new S Pen is also getting Bluetooth Low Energy (BLE) connectivity, enabling it to perform a variety of tricks that were not possible before. The new connected S Pen allows users to control the Galaxy Note 9’s camera within a 10-meter radius. It makes taking selfies and group photos incredibly easy as the button on the new S Pen can be used as a remote camera shutter button. Users can also switch between front and rear camera effortlessly with a double click of the S Pen button. The new S Pen also functions as a remote for controlling presentations and various media player apps. Simple controls like play, pause, skip to next are all mapped to single and double clicks of the S Pen button. Users can also configure favorite apps and features to launch instantly from anywhere with a long press of the S Pen button. All of these connected features require a stable connection between the stylus and the Galaxy Note 9. Samsung has worked to take care of this by making sure the new S Pen is automatically paired as soon as it is removed from the device. With the BLE connectivity, it can maintain a stable connection even when the Bluetooth is turned off. Samsung also improved some of the software features that make the S Pen so unique. The Live Message feature from the Galaxy Note 8 is updated with support for AR Emoji stickers, making the feature even more personal and fun. 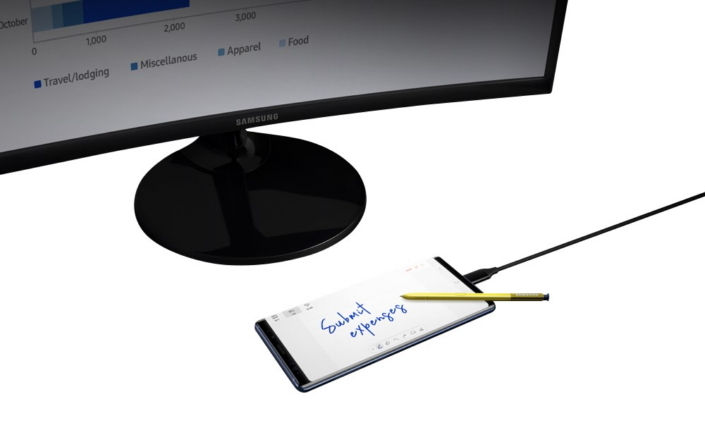 Users can also take notes with S Pen when the Galaxy Note 9 is in DeX mode. There are new PENUP-powered drawing features to cater to the creative souls. Samsung also has an open SDK for developers to build cool new features and apps for the new stylus. The new S pen boats IP68 certification for water and dust resistance. The Super Capacitor on the new stylus takes just 40 seconds to fully charge and can last up to 30 minutes or 200 clicks. Even when the S Pen battery dies down, all the traditional S Pen features work without any problem. Most convenient of all, the S Pen charges automatically when inserted back into the device. The post The S Pen in the Galaxy Note 9 packs a lot of new features appeared first on SamMobile.